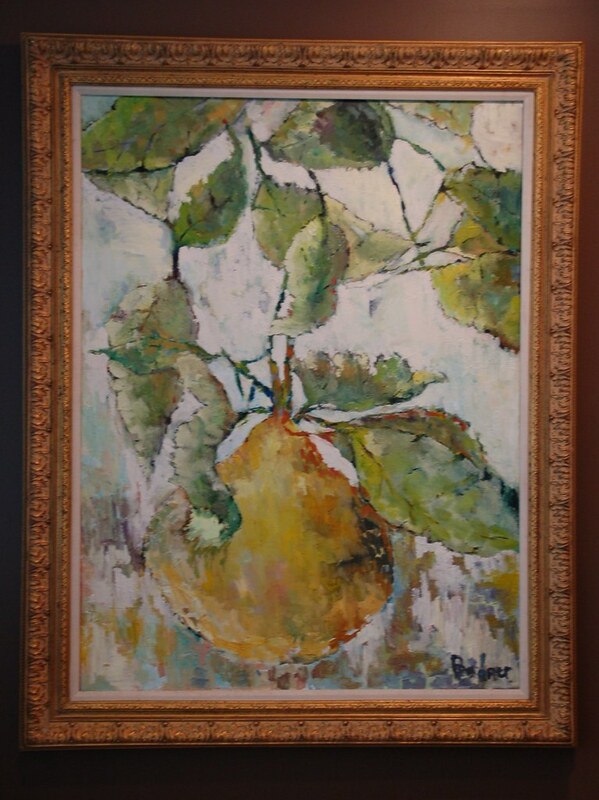 Recently I admired a beautiful painting of a pear in my neighbor's dining room (seen below), set off perfectly by a rich chocolate colored wall. My neighbor purchased the painting over 10 years ago at the first solo show of Dr. Gary Bodner, one of Atlanta's foremost obstetrician/gynegologists. Gary has had a lifelong love of art, but it wasn't until 13 years ago that he began to explore his artistic side through painting classes. Although he is still practicing medicine (and has been in practice for 30 years), he paints every day and has a beautiful abstract impressionistic style that improves and deepens every year. This Friday, September 11th, Gary Bodner will have his third solo show at one of the my favorite art galleries in Atlanta, Anne Irwin Fine Art. I was invited to a sneak preview of Gary's recent work at his home, and we spent an enjoyable hour talking about painting, design, color, and the love of art that we both share. Gary is taking his art and the exploration of his medium into totally new directions, and the latest collection of paintings is one of his best ever. 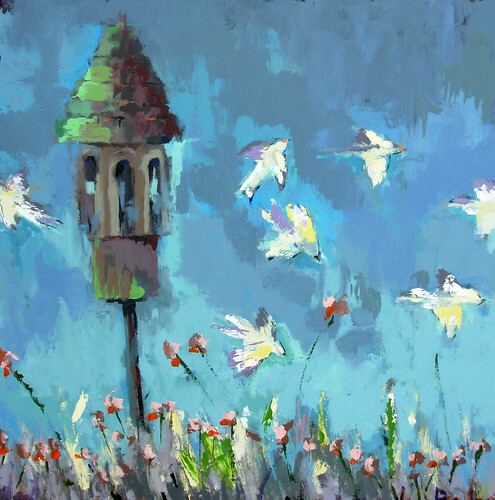 In a recent article in a local paper, gallery owner Anne Irwin said that his style truly cannot be categorized; it is more about color and the vibrant application of paint to canvas than any one particular genre. For this reason, I think Gary's paintings are incredibly versatile and would work well in so many different kinds of environments and contexts. The following pictures are just a few of the paintings that will be part of Gary's show this Friday. 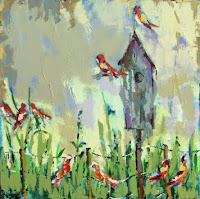 Birds are a new theme that Gary has introduced into his paintings this year. 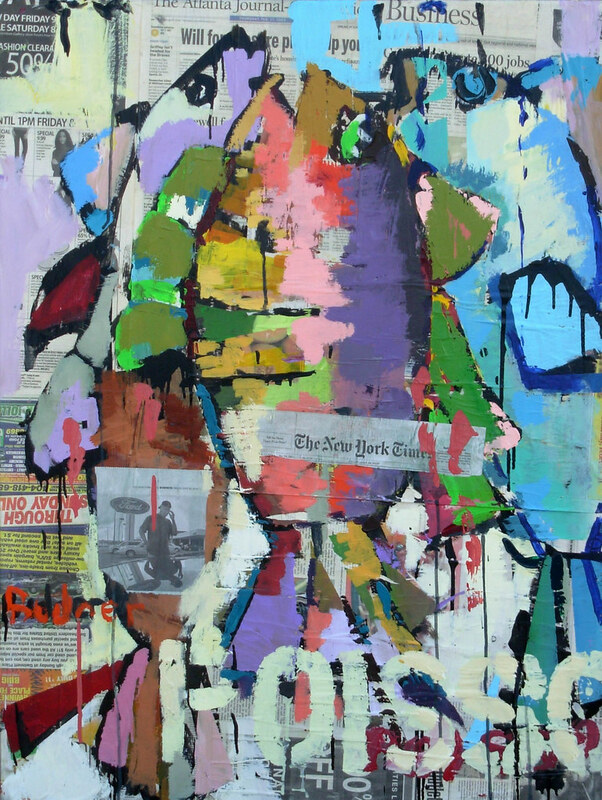 A clever mixed media piece that highlights one of the new directions of Gary's work. 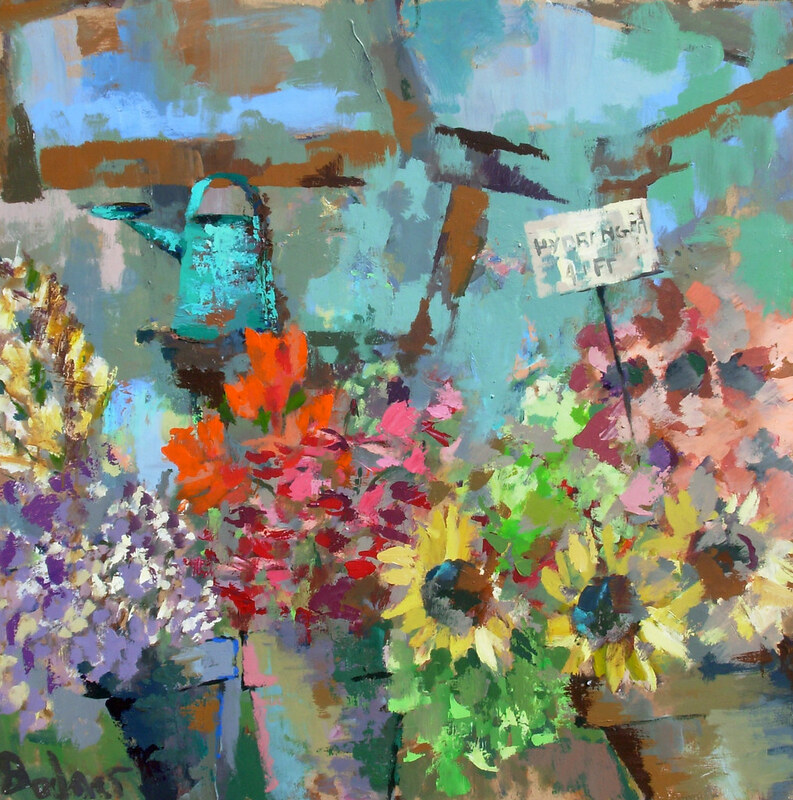 A colorful floral, but in Gary's unique style makes this an impressionistic piece with a touch of the abstract. In my experience, paintings that have aspects of both impressionism and contemporary are very successful for people who want to start buying more contemporary style pieces, but still like traditional subject matter. I love this painting, and it is interesting to see how it has evolved since I saw it at Gary's house last month. 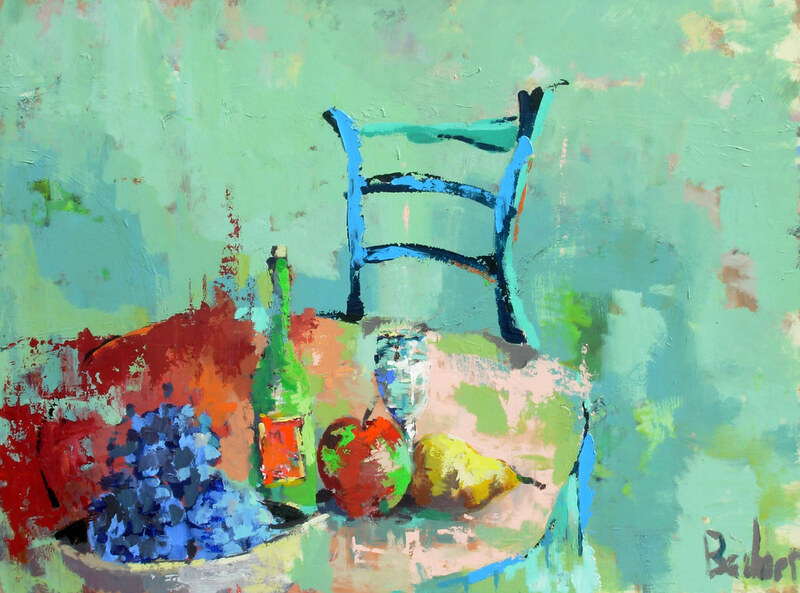 The vibrant colors in this painting really sing, and the composition of the chair in the background, and the tablescape in the foreground, makes this a wonderful piece. If you are in the Atlanta area, the opening reception for Gary Bodner's show takes place at Anne Irwin Fine Art this Friday, September 11 from 6:00 pm - 8:30 pm; the show runs through the end of September. The address is 25-D Bennett Street NW Atlanta, GA 30309; the phone number is 404.352.1855. Please visit the Anne Irwin web site for more information and for directions. Those are beautiful! He is very talented. There is a softness to his art that I like. Thanks for sharing his talent. I am familiar with Gary Bodner's art and his reputation as a caring and gifted physician. I think it is wonderful to view here on your blog this morning. oh my goodness, these are stunning! i wish i was in atlanta this weekend! These paintings are so happy. They would make any room sing. Thanks. Great color palette! I love the pair painting, all are wonderful. His work is incredible! I especially love that birdhouse. Thanks for sharing him with us. It's great when you meet those rare people....that have both right and left sides of the brain operating. A talented doc,,,,,love his work, so unique. Thank you for the introduction to a new artist. Love his ability to paint light. What a wonderful talent. Love the crossover to mixed media. Such beautiful work. Sparkly and happy. Thanks for sharing them. This guy is really talented, his paintings make me smile! He does great work and I love the abstract fish on the newspaper! Thanks so much for the sweet words on my 100th post....I appreciate it from you as you are an inspiration to me! Love this work! I am going to forward it to my friend whose paintings I just posted about. I love what you said about transitioning from more traditional to contemporary art - he is really good. Thanks! Dr. Bodners' art is indeed beautiful and quite inspiring! Having been acquainted with him 20 years ago as a patient, I hope his creative expression has softened his bed-side manner. When I read the posts about him being a caring physician, however, this is not the person (whose insensitive comment haunts me to this day) that I knew. if only i could REALLY PAINT. The painting on top of the news publications is simply a stroke of genius. I love his work! He has a style unlike anyone else.Thanks for sharing it . Very artistic! I like this way of painting! Thanks for sharing the art. His work is interesting. Love his work. So not fair to be extremely smart and creative. What a package! love them.. they are completely beautiful.. absolutely gorgeous.. Absolutely lovely. I have found that physicians and surgeons are often extremely talented with the arts of painting and detailed needlework. I will be a return guest to spend more time enjoying your gallery.